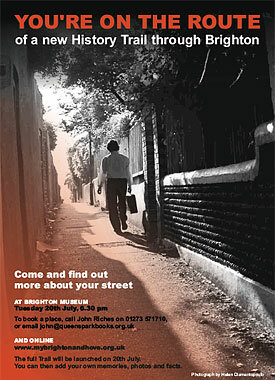 In 2002, the My Brighton and Hove community archive created a history trail through Brighton for the 24 Hour Museum. Based on that experience, we wrote the guidelines you can download at the foot of this page. The guidelines describe how a group of people can get together and make a history trail. The process is designed so that no one single person has to do too much work. While a couple of individuals create the main commentary for the route, other volunteers collect additional stories and photographs inspired by places along the route. You can read about the experiences of some of the volunteers who worked on our History Trail at the end of the guidelines. The overall timetable for the project is 3 months. This is if you’ve already got all the volunteers you need. If you haven’t, you need to add another month. You can follow our own History Trail around Brighton online or download it below if you’re visiting Brighton and want to walk the route.